Welcome to our first October Sponsor highlight!! Amber is super creative and beyond talented with the crochet hook. I am fortunate enough to own a few of her amazing creations!! Amber's blog Hoot-N-Annie is always filled with inspiration and love. It's one of my faves!! Amber also has a super cool Vintage Etsy shop that you can check out right here. 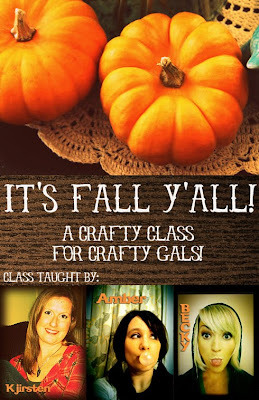 It's Fall Y'all is a 6 week online class taught by Becky Farley, Amber Cox, and Kjirsten Cantrell. This is a must for those who are in need of a creative fix, wanting to decorate your home for the Fall Season, or want to get a jump start on holiday gifts. The class will begin on October 17th and includes 30 projects for $30.00. That is only $1 a project! Yippee!! Supplies needed are mainly craft items you already have on hand or that are easy to find in local craft stores. We also have several projects that involve things from nature. A sewing machine is used for some of the class projects, but these can be sewed by hand as well. A full supply list will be given on our private class blog. This class is designed for you to craft at your own leisure. There are no deadlines. The last project will be posted on the week of November 28th. However, the private blog will remain up for year allowing you access the entire time. We have also created a flickr group, so that you can meet, share and encourage your classmates. You can sign up for the class here and find out more on the projects here.The class just began and will remain open for others to still join in on the crafty fun for another week. I am giving away one spot in the class to a lucky Run With Scissors reader. All you have to do to enter is leave a comment below telling me what your favorite Fall Family Tradition is. I will draw the winner this Sunday evening and will announce the winner on my blog. Good luck! I am totally leaving a comment because I want to win a space in this class BIG TIME!!! This year my favorite fall activity is watching my son explore the outside and spending cooler nights cuddled up on the couch with a hot chocolate a hubby and a baby. My favorite fall activity is carving pumpkins and baking pumpkin pie. i'm in! this class just looks amazing! magic and excitment of finding the perfect pumpkin! My favorite fall activities usually include good friends, walks along crunch-leave laden sidewalks, a scarf around my neck and a chai tea latte in my hand. My favorite fall activity, is carving pumpkins with my brothers, and baking the seeds! Every year, my family and I take our boston terrier Goldilocks to a dog Halloween party at a local park. All of the dogs get to go on a bone hunt, bob for hotdogs and compete in a costume contest. They sell refreshments, accessories and raffle off prizes with the proceeds going towards the boston terrier rescue. My kids have a blast and me & my husband do too...and of course our dog Goldilocks! my favorite fall activity is, of course, pumpkin patches with my family! We have already been to 2 and are going to another one this weekend! I would LOVE to win a space in y'alls class! you are super creative! OMG love your blog i just read every single blog entry yesterday you are awesome. I am totally creative and would love that spot! My favorite fall activity with my family is to help my mom clean the house then sit down with hot chocolate and pumpkin pie in my family room and watch re-runs of our favorite shows. nevermind dont put me in the contest just realized i cant do it :( still love your blog though! My favorite fall activity is going to the pumpkin patch and having the best time with the family! My favorite fall tradition is carving pumpkins with Seth and then roasting the seeds! Yum!! My favorite fall tradition is Friends Thanksgiving (started by us 12 years ago when our friends couldn't go home to their real families). After all, our best friends truly are family to us! Having my huge family gather at my Grandma's house for Thanksgiving! My most favorite thing to do each fall is get a pumpkin, carve it, and roast the seeds! Hmmm... my favorite fall tradition was always going to my best friend's Halloween party. Her family always put together a HUGE haunted walk through the woods in their backyard. It is SO amazing! i LOVE LOVE LOVE LOVE visiting the pumpkin patch and baking vegan pumpkin pie!! One of our family traditions which is dear to my heart. I cook Thanksgiving dinner by myself alone starting the day before. I may recruit someone to peel the potatos but that is about it. My dad & I always did our turkey dinner together w/him doing the turkey showing me his secrets to a super moist turkey. This is my time to spend w/my dad in memory of all of our memories & happy days. he has been gone for 9 yrs now & on this day I feel he is so close to me. Oh yea and Hubby cleans up! I would love to win this space for this fun class, I love creating new stuff & upcycling! Xing fingers! my favorite fall activity is going to the pumpkin patch as a family, then cracking up as we try to carve them! My favorite tradition is to go into the Pumpkin fields at night and wait for the Great Pumpkin to appear. No wait, that's Charlie Browns. Go to the community center for the dog's dress up Halloween party. My favorite fall activity is when my mom makes her homemade vegetable soup and invites me over to enjoy it. It's so warm and cozy! I love making some cider and getting messy with some pumpkin carving! Wowza! My favorite fall activity is going to the pumpkin festivals and such with my family. So much fun! favorite thing to do is to sit around grandmas table and play games all night long. maybe have a cheese dip fix in the middle..it gets rough around there and your in some need of a snack. My favorite fall activity has to be playing in the leaves! That looks like an awesome class!! Favourite fall tradition, baking cookies with my mom, when I was little she always picked a day in a weekend where we would bake cookies, and even though I'm 26 now, I still love baking cookies with her, some me and my mom time. We do make pumpkinsoup too now! I want to take this class so bad!! My favorite family part of this season is carving pumpkins! it's something robin and i have done since we started dating! This year our good friends are having a pumpkin carving party and I can't wait to go!